Teach Your Pet To Avoid Areas in Your Home. 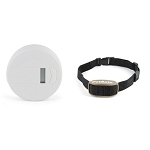 The PetSafe Pawz Away Indoor Pet Barrier Transmitter will broadcast a radio signal up to a 6 foot radius (12 foot diameter). 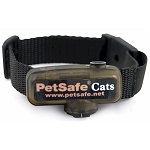 Your pet will wear a collar that will deliver a mild correction when it comes into this signal range. 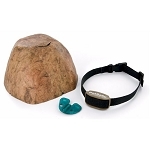 When your dog first enters this range he will receive an audible tone followed by mild stimulation that will increase the closer he gets to the transmitter. The fast, easy, no-training way to keep your dog from problem areas. 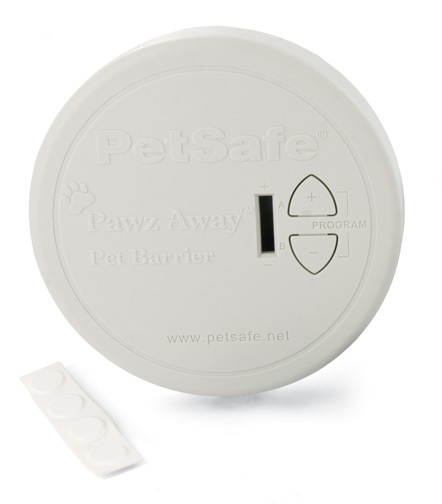 Unlike other deterrents, the PetSafe Pawz Away Indoor Pet Barrier Transmitter is totally cordless. You can put a transmitter near anything you want your dog to avoid - the trash, kitchen counter or fine furniture. My dogs were jumping on my really good sofa and shedding all over my comfortable furniture. When the puppy peed on the good sofa, I wanted to kill her! These are awesome. I have three transmitters now. The radius doesn't quite go to 12 feet, but it keeps them out of the kitchen and off the furniture. One shock collar wasn't working (probably because my dogs are rough with each other). 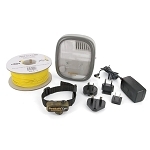 Called PetSafe and they walked me through trouble shooting. When that didn't work, they sent me a new one for free. Great product, great customer service. I took in a cat that needs a lot of medical attention and can not have certain foods or use my other cat's litter box. With the sensor in the bathroom where my other cat's food, water and litter box are in, these two can live together in harmony without any problems with shared use. It has been great!! We bought two transmitters and two collars for two dogs. We had a problem with them going into the back room and tearing into the kitty litter. They also liked to pee in a particular room. I put a transmitter near the entrance to both rooms, set them on the highest setting (Not forgetting to enter the A/B setting for both collars of course) and they haven't entered the rooms since. The first day, one of the dogs got quite a surprise when trying to enter the room. This really is the best thing I have ever purchased. We have a high energy border collie mix pup who just couldn't help herself from jumping on counters and table to swipe food, go where she is not allowed, etc... It was a big stressor for our whole family. But ever since we bought the Pawz Away collar and disc, she has gone from being a "naughty puppy" to a "good girl" overnight! I think she really likes knowing where her boundaries are. And I love how she now receives constant praise. I have two discs and I'm thinking of purchasing a third. I can't say enough great things about this product. Also, the shock isn't a bad shock (I got zapped one day when I had the collar in my hand), it's more like a static shock, so it doesn't hurt her-- just annoying enough that she doesn't like it. No more dog on couch. No more dog in the bedroom hallway. No more dog in my vegetable garden. Unbelievably effective. The second day we took the collar off, we just didn't need it on her anymore. Thanks for giving us our sanity back!